Hello, we are Michael and Paula Thomson. 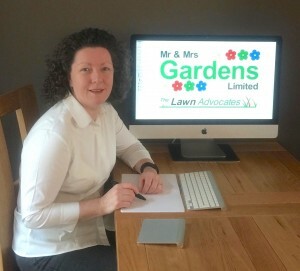 We are are the directors and owners of Mr & Mrs Gardens Limited. I was brought up and educated in East Kilbride. After completing my secondary school education in the town I joined the Army and served as a commando gunner in 3 Commando Brigade. My interest in gardening didn’t begin in the military, but I certainly learned how to work hard and how to do a job properly, with professionalism and enthusiasm. I left the Army with an exemplary military service record. It was about this time in my life when my interest in gardening began. I started by helping my parents look after their garden. My Dad was in poor health and he couldn’t manage cutting the grass or hedges, but still enjoyed being able to go out in the garden. I carried out all the jobs my Dad couldn’t manage. This meant my parents could still enjoy a spot of light gardening without having to worry about the heavy labour intensive work. I’ve had a couple of careers since leaving the Army. I was a Social Worker and worked with vulnerable adults, older people, and children and teenagers with multiple and profound disabilities. I also spent time working as a Social Worker in a busy Accident & Emergency department of a city hospital. As if my Social Work career wasn’t varied enough, I later went on to train and practise as a corporate and business Lawyer in England and in Scotland. Unfortunately following the global financial crises and banking collapse in 2008, I found myself without work. However, I was fortunate enough to pick up some part-time tutoring work with the Open University and later with the University of Strathclyde. This part-time work gave me the time to think about setting up my own business and working for myself. Paula and I made the decision to set up in business together, and we created Mr & Mrs Gardens Limited. I’ve lived in East Kilbride all of my life. My Dad worked in the Rolls Royce factory in the town, and he and my Mum were among the first residents in the new town. I come from a large family, and I’m the youngest. I have lovely memories of my Dad working away in the garden and me helping him. He, like many of his generation, was very particular about how the grass and hedges should be cut and maintained. He kept our garden neat and tidy and made sure the grass and hedges were cut regularly in order to maintain their good looks. I still live in the house I grew up in, and I still cut and care for the same hedges my Dad started cutting and caring for over forty years ago. He taught me so much, as did my older brothers and sisters. I am very happy to be able to take care of the garden with the same enthusiasm as my Dad. This enables my Mum to continue to enjoy the benefits of a well maintained garden. I’ve not had anything like the varied careers as Michael has had. In fact, I have been a Civil Servant since I left school, and I still work part-time as a Civil Servant in East Kilbride. 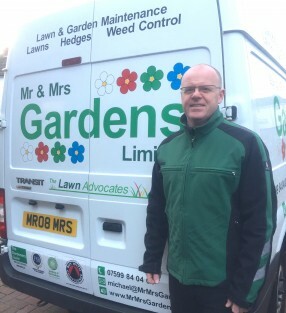 I am delighted Michael and I can run our gardening business at the same time as being able to care for my Mum and our young children (our own little ‘Flowerpot Men’). Hello. I’m Blade, as in ‘blade’ of grass. 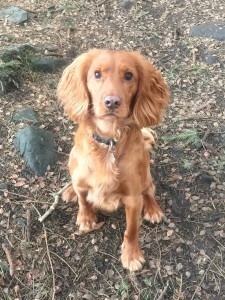 I’m a working cocker spaniel, and I’m the company mascot. Playing, sniffing, finding things, and running really fast are my favourite things to do. I also love getting cuddles, and meeting other friendly dogs and humans. If you are looking for some more reasons to choose us as your garden maintenance services provider, we’ve made an A to Z video that may help – 26 reasons to choose Mr & Mrs Gardens Limited. Thank you for taking the time to read more about us and for watching our video(s).